​I am not a pumpkin spice person. Often, I find pumpkin spice branded food to be too sweet and generally lacking in flavor. 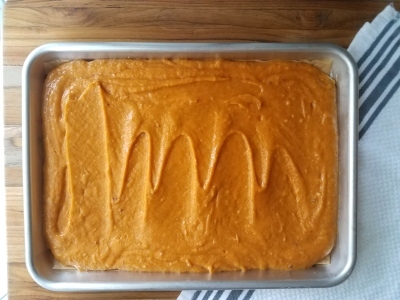 But fall is pumpkin spice season, especially in New England, so I often make pumpkin desserts for events or get-togethers. 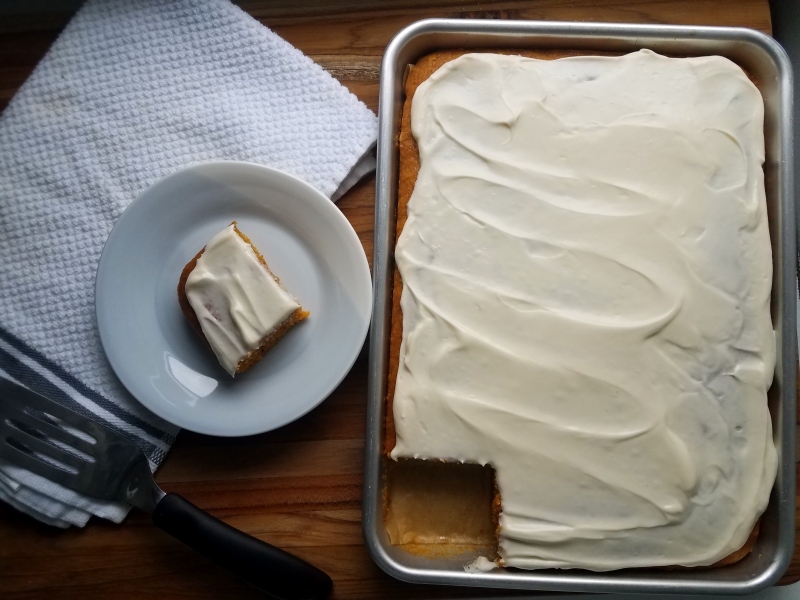 This weekend, I found myself with a Halloween potluck to go to and an open can of pumpkin in the fridge and decided to whip up this sheet cake. The recipe is one of my mom’s. Growing up we always called them pumpkin bars, though labeling them bars was a misnomer. This is cake, with a delicate and moist crumb and a swirl of cream cheese icing on top. 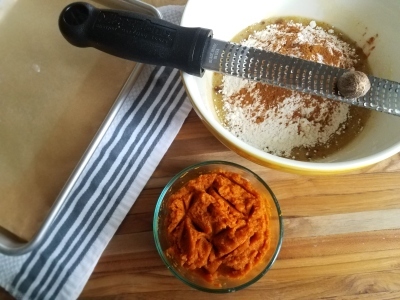 I updated my mom’s original recipe in an effort to ratchet up the “spice” element of pumpkin spice. 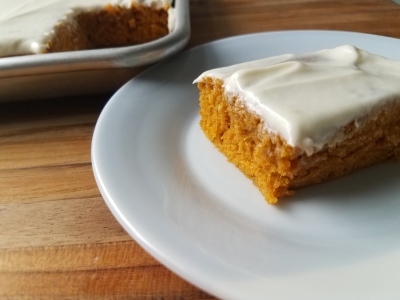 Pumpkin has a very mild flavor, which I think is why so many pumpkin spice recipes seem to fall flat -- too much sugar without enough spice leads to cloying blandness. To combat that problem, I increased the amount and variety of spices in the batter and substituted some of the oil for brown butter. 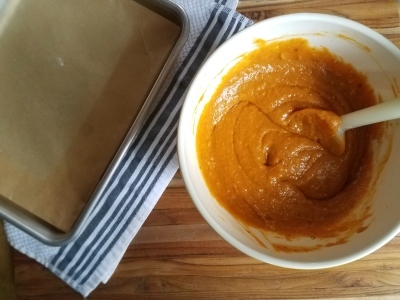 The spice blend gives the batter warmth and dimension, while the brown butter adds caramel undertones to recipe and makes the pumpkin flavor seem more pronounced. Browning the butter is a finicky additional step, but worth the effort. I wouldn’t skip it, but I also wouldn’t completely replace the oil with butter, as I suspect the decrease in moisture will have a negative effect on the crumb structure. I usually bake the cake in a rimmed cookie sheet which results in a giant cake about 1 to 1.5 inches tall. 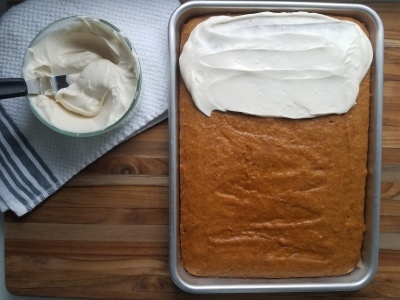 The cookie sheet version is great for a crowd (especially since the cake can be made a day or two ahead without drying out in the fridge) but I don’t see why the recipe wouldn’t also work in 2 8-inch cake pans or as cupcakes. You’ll just need to watch the cook time -- I’d set the timer for 20 minutes and then keep checking it every 3 or 4 minutes after that. Preheat oven to 350 degrees. Grease a jelly roll pan or cookie sheet with high sides. In a small skillet, melt butter over medium heat. Allow the butter to bubble and toast until brown and fragrant. This can take 5 or more minutes. You’ll know it’s done when the butter separates into two layers and the solids at the bottom of the pan are golden brown. Remove from heat and allow butter to cool slightly. 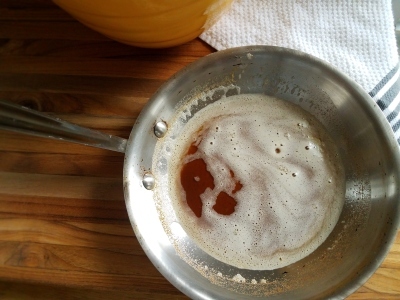 In a large bowl, whisk together oil and sugar. Continue whisking as you slowly pour in the cooled butter, making sure to scrape in the solids from the bottom of the pan as well. Once blended, whisk in eggs one at a time. Stir in spices and baking soda followed by the flour and finally the pumpkin. Continue mixing until all ingredients combined and batter is a uniform color, being careful not to overmix. Spread the batter evenly the prepared pan and bake for 25 min or until a toothpick comes out clean. 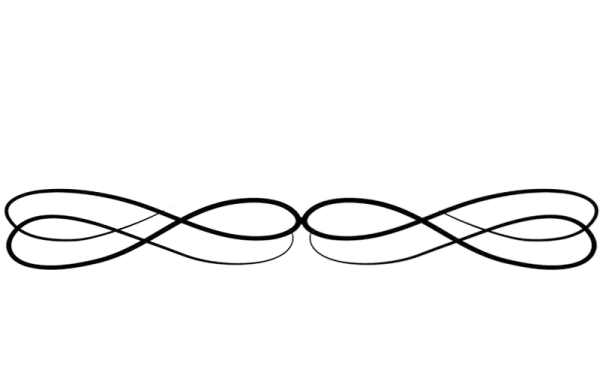 You’ll know the bars are done with they are set on top and spring back when pressed gently. Allow to cool on a wire rack. 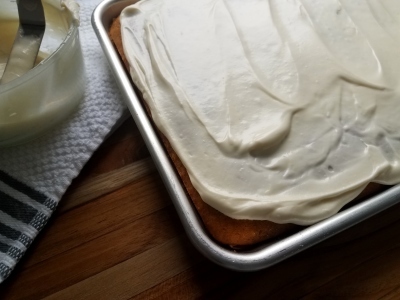 To make the frosting by beating all ingredients together until smooth. Frost the bars and then refrigerate until ready to eat. Bars will keep in the fridge for 5-7 days.